Illustration courtesy of Barnes Bullets. One of the most often debated topics in frontloader city is bullets, and what constitutes good terminal performance. There is obviously no quick and clear answer, for if there was even the more sluggish of us would all be shooting bullets of the same basic design in what is primarily a deer hunting driven sport. One unique, yet well proven bullet that I have personally been tremendously ignorant about is the Barnes MZ Expander line, championed by Knight Rifles in various forms as the "Knight Red Hot" bullets for some time. The most proven Barnes muzzleloading projectiles, the wide hollow point "tube" type 250 and 300 grain versions have been recently augmented by the more ballistically efficient "Spitfire" 245 and 285 grain spire point boat tail offerings. The Barnes Spitfires (as depicted above) are also sold as the newer Knight "Ultimate Slam Series" SBT bullets: the identical apple. So, with some research, range time, and a couple of hunts the goal was ignorance eradication, even if incomplete. Barnes bullets are not designed to function in the same manner as most other muzzleloading bullets. Recovering bullets from partially frozen earth at 130 yards revealed little expansion, only bent beaks. This completely normal, as the nose cavity needs to be filled with fluid for the bullets to open up starting at 1000 fps for the "Expanders," and in the area of 1100 fps for the "Spitfires." What this means is that we can expect a different type of performance from lead bullets, based on shot placement. With honey hole type shots, expect hydraulic opening of the hollow point and pass-through performance. When breaking an animal down through double shoulders, the bullet may not expand fully; but again; you can expect broken shoulders and a pass through. While the bullet debates are often best left to the internment of merciful time, deer don't care how fast you miss them. Without accuracy, we can expect nothing good to happen. Range work was done with two rifles, primarily a Thompson Encore and a Savage 10ML-II. The Encore (with a bit tighter bore than many muzzleloaders) favored the 245 grain Spitfire. The 250 and 300 gr. Expanders proved next to impossible to load. The Spitfires, stated as .451 bullets, actually measured .4500 to .4505 inches, a bit undersized. The special MMP manufactured sabot for the Spitfire is intentionally undersized. This combination was to the Encore's liking, but loaded far too loosely to be accurate in several other muzzleloaders. It has worked accurately for many Omega shooters as well, and is excellent bullet to try in any Thompson .50 caliber inline product. But, if your barrel is on the loose side opting for the "Expanders" will likely prove more fruitful. With the Savage 10ML-II, the Spitfires just dropped down the bore, and gave no accuracy of note. The 250 and 300 Expanders loaded properly, and the 300 grain Expander proved to be the ticket, yielding sub-3/4 MOA 100 yard groups in my test gun. There are a couple of other range observations that are remarkable, which is likely why I am remarking about them? The Barnes bullets consistently yield higher muzzle velocities than either pure lead bullets or Hornady XTP's. 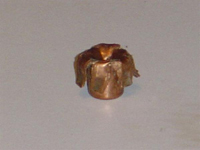 The reason for the increase over pure lead saboted bullets is the heat-treated copper Barnes bullets can suffer no column collapse or obturation upon firing--they just go straight ahead. Even Hornady XTP's apparently obturate a small amount at the base during initial set-back, giving the Barnes a small but very real muzzle velocity advantage. The Barnes bullets generally weighed within a grain of each other, far better than most jacketed bullets, but not as close as some pure swaged lead bullets. Barnes is to be applauded in the stated ballistic coefficient department, as they are very close to giving 200 yard chrono to chrono averages. This is in stark contrast to companies like Precision Rifle that inflate their ballistic coefficients to no end, lying about BC's in an attempt to sell more bullets. Good for Barnes. The 300 gr. Barnes .451 / 50 MZ Expander has a stated .207 BC, and it measured at .206 screen to screen. This positions the Barnes clearly better than cannelured pistol bullet class projectiles, but a notch back from Buffalo SSB and Hornady SST level bullets. The often pondered question is, "Do fast expanding bullets kill better or quicker than limited expansion bullets?" The answer is vague, imprecise, and contingent on shot placement. We have all heard "kinetic energy transfer" being mentioned, but that is a tortured way of getting to what we really want: tremendous damage to vital organs, and formation of a large wound cavity. Flyweight bullets that expand cannot always make it through the body cavity, and I've witnessed lost animals due to this. Heavier pure lead bullets have shown to be the better, cleaner game-getters with better sectional density for deeper penetration to get the job done. Even with very heavy (460 grain) pure lead conicals, an exit wound is not a certainty. Against the hide on the far side, lead hits like a pancake ball peen hammer, and cannot give you an exit wound if that is your preference. Scissors cuts paper, and the Barnes will give you a complete pass-through where other bullets cannot. Whether that makes the Barnes a better killer is still contingent on shot placement and the individual animal. By virtue of having no core, the Barnes cannot have the core separation that bullet companies try so hard to avoid, so you can expect excellent to 100% weight retention. Where this places the Barnes bullets in the muzzleloading arena is subjective, so I'll offer up my take. Based on what I have seen, the Barnes bullets are clearly superior to Hornady SST's in terminal performance, closely approximating Partition Gold level performance but with better weight retention. Hornady XTP's have been devastating on deer; the Barnes will give you complete penetration where the XTP's do not. The Barnes bullets offer flatter trajectories than XTP's of similar weight. Accuracy still reigns supreme, so letting the gun voice its preference between XTP, heavy lead sabot, and Barnes Expander will likely be the determining factor for many. On a recent hog hunt, a 260 grain lead bullet (while cleanly taking the animal) had zero drops of blood at the entrance wound, and did not exit. The 300 grain Barnes bullet I used blew right through my hog, and the cactuses were spray-painted with crimson for the short distance the pig was able to move before collapsing. I'll give the Barnes bullets a clear nod for truly big game, when an exit wound is desired, or when driving them faster than pure lead can bear. When going through the chest on an animal, the Barnes also gets the nod. Also, I can tell you that my 10ML-II loves the Barnes 300 grain. via Knight Extreme. MV of load used: 2020 fps. Photo courtesy of Ron Brown, Corning, Iowa. With a 2200 fps muzzle velocity, the 300 grain MZ Expander is a 200 yard plus MPBR six inch kill zone bullet. At 200 yards it retains 1525 fps of velocity, and about 1550 ft. lbs. of energy. This is still well within the design parameters for positive hydraulic expansion, and is a load that will take most any game animal in North America. I can certainly see myself taking more game animals with Barnes MZ Expanders in the very near future. They have been an overlooked, extremely lethal muzzleloading bullet that simply cannot fragment. If "free" increased muzzle velocity and positive exit wounds appeal to you, I think you'll want to give them a try as well. You might never look back! Copyright 2005, 2013 by Randy Wakeman. All rights reserved.